An arbor, or pergola, is one of the classiest and most functional ways to perk up your old patio, porch, or deck. They’re often used as a type of gazebo, an extension of a building, or create open-air terraces or links between buildings. When not attached to a building or home, a pergola or arbor becomes an elegant garden fixture for relaxing and enjoying nature. Unlike a patio cover, a pergola isn’t designed to completely shade an area or protect from the elements; rather they’re intended to reduce sun glare while allowing clear view of your surroundings. They’re most often considered a patio or garden feature on which vines can be grown on to add color and natural beauty to an area. Pergolas or arbors may have a flat or slightly slanted roof with room for plants and sunshine between the wooden beams. However some home owners choose to add either handmade 1×2 lattice or 2×2 slats to provide more shade or privacy. We can also add poly-carbonate panels to offer you even more protection from the elements. They may be built to fit any size deck, patio, or garden area. Use a pergola or arbor to cover your outdoor kitchen, a private reading area, or your hot tub. It’s the perfect way to reconnect with nature while disconnecting from the stresses involved in daily life. Create a living privacy wall and ceiling with a flowering vine, and enclose yourself within nature. A pergola or arbor may even be used as a greenhouse in certain locations and climates. The open roof allows the sun and rain to nourish plants while providing just enough shade for you to enjoy your plants. Go an extra step further and implement a wet bar, outdoor kitchen, or sauna. 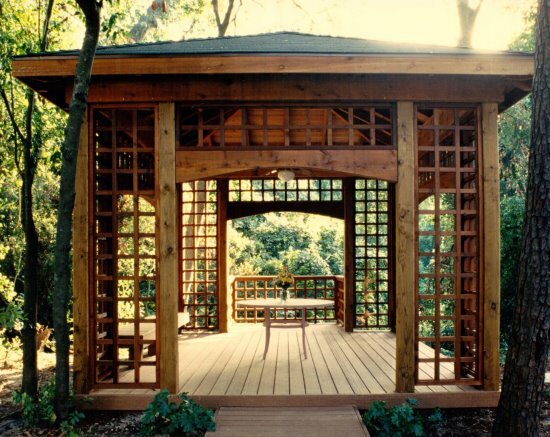 Pergolas or arbors may be built using any type of wood though cedar and treated pine are used most often. Through our use of high quality materials, from start to finish, we can ensure a high quality finished product. Often we will use other materials including slate tile and other natural materials to complete the look you desire. When you hire Texas Decks to build your pergola or arbor, you’re hiring a long term Texan with years of experience building in Texas. My team of experienced builders enjoys the challenges today’s homeowners place in our path. We gladly step up to the challenge, offering our expertise as you describe your ideal pergola or arbor to us. Together, we will build the pergola or arbor you want. You’ll never deal with a middle man when you choose to work with Texas Decks; I take care of business myself. I’ll be there from start to finish answering any questions you may have along the way. Thank you for your interest in arbors and pergolas by Texas Decks. Before you go, if you would like to see some of the arbors and pergolas we have previously built, check out our gallery of past projects here. If you’d like to see what some of our clients have to say about us, click here. If you would like to speak to us directly, call 281.960.2061 or contact us through our website by clicking here.